While traveling over Thanksgiving I was thinking about how the 6502 microprocessor works and wanted to analyze some Boolean logic circuits. A trivial programming task but the only computer I had was my phone. I downloaded DroidEdit Pro which gave me a fullscreen editor for files on my phone. Typing HTML on the phone was painful until I downloaded the Hacker's Keyboard, which makes it much easier to type special characters. The picture below shows these tools in use. Edit the code in DroidEdit and save it to a local .html file. 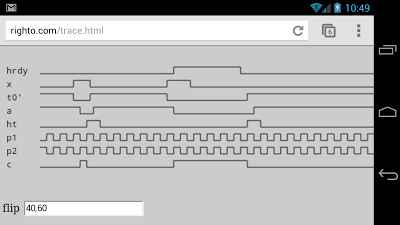 Select 'Preview in Browser' from DroidEdit and test the program. Upload the file to my web server using DroidEdit's SFTP support when ready. Obviously this environment isn't as powerful as a full-size keyboard and monitor and powerful editor, but it lets me program no matter where I am. I haven't got the hang of cut-and-paste in the editor, but shift-arrow seems to work better than tapping. Here's my program in action. It wont get any style points - I rapidly lost my enthusiasm for whitespace with the tiny keyboard - but it got the job done. I also used this development environment to show my nephew how to make web pages with HTML. He thought it was very cool that he could type HTML into the phone, hit Control-S to save, and immediately load the web page on his iPad. He's now busily learning HTML and building his own web pages. I hope these tips help you program while on the road. Leave a comment if you have tips of your own. This is really cool. 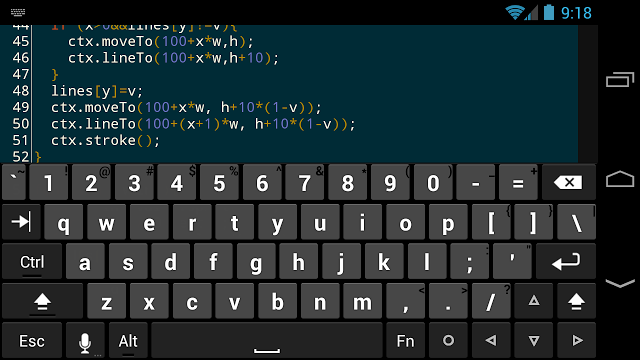 I don't know exactly how often I would want to program on the go, but still a cool idea. that would make thinks much easyer..
other option is a small Bluetooth keyboard.. Your work is being plagiarized.